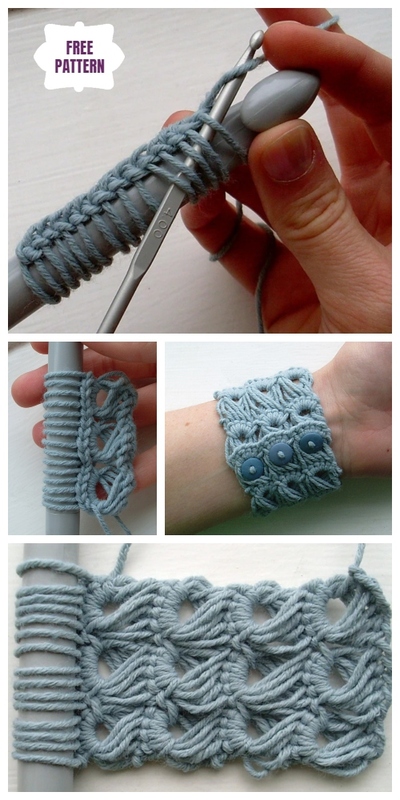 This Stylish Crochet Broomstick Lace Bracelet is one of my favorite, fun and quick to crochet. Crochet broomstick lace stitch is another one of the most unique and fabulous stitch among all stitches. It is good for bracelet, or hairband, or belt, scarves, hats etc, add some fancies to make it brilliant with your style. This crochet technique is good for bracelet, or hairband, or belt, add some fancies to make it brilliant with your style. You don’t need very much for this small project. A thick knitting needle would be perfect because of the tapered point for sliding stitches on and off. The thicker your “broomstick” the longer the lacy clusters will be. It would be great fun to use Popsicle stick to make this broomstick stitch, or other tools such as ruler, pencil etc.